Samuel is old and traveling in a yearly circuit to fulfill his religious duties throughout the territory of Benjamin. He appoints his two sons as judges, and this is a questionable appointment, since normally God appoints judges. The oldest is Joel, meaning, “The Lord is God,” and the second is Abijah, meaning, “My Father is the Lord.” However, neither lives up to the meaning of their names, since they do not walk in their father’s ways. Samuel sends them to work in Beersheba, a remote town located way down at the southern border of Israel far from where he lives and judges. The town is small, with a population of less than two hundred, and their work is mainly settling disputes between inhabitants. But in their position, “they turned aside after dishonest gain, took bribes, and perverted justice.” 1 Samuel 8:3. Only one flaw seems apparent in Samuel’s character—and ironically, it is the same flaw that Eli, his mentor, suffered from, since both men apparently fail at correcting of their sons. This brings dishonor to the God and disgruntlement among the people. The elders come to Samuel stating that he is old, his sons are wicked, and as a result they want him to make them a king, like the other nations. They believe that their organization of federated tribes has put them at a military disadvantage and they think a king with a standing army will give them a greater advantage to defend themselves and their land. The king will establish a centralized government—and himself as the supreme authority and head of the standing army. This army, and a supporting administration of government officials will need to be housed and fed. The king will appoint their sons to serve with his chariots, to be his horsemen, and run before his chariots to announce his presence and provide protection. Some of their offspring will be full-time officers in the standing army, while others will till and reap his royal lands. Others will make weapons for the army and maintain the chariots. The weapons for the army include war bows, arrows, swords, daggers, shields, and javelins. Their daughters will serve the king as perfumers, cooks, and bakers. Perfumers regularly perfume the king’s garments and spices are burned to produce a pleasant aroma in the palace. Some spices also have medicinal value, making them a type of pharmacist. The cooks and bakers have to feed the extended royal family in royal style. There may also be prisoners and servants of the king who need at least meager provisions. Attractive private properties are often confiscated by the king to give to his loyal and favorite administrators. Often a servant or a noteworthy animal would attract the king’s attention and cause him to take them into his possession. When this type of thing occurs, the commoner essentially has no choice but to offer whatever meets the king’s fancy as a gift. Ten percent of all increase belongs to God and is to be used to support the priesthood and the sanctuary. However, the future king will demand of his subjects a tenth of their grain, vintage, and sheep, putting himself in the position of equal to God in this respect. All the warnings Samuel delivers seem to fall on deaf ears, since they want to “be like all the nations” and want the king to “fight our battles.” They no longer remember that victories only occur when God fights the battles. They want a king to fight their battles, but they forget they are his army! A man named Kish from the tribe of Benjamin is a wealthy and powerful chief who has a very tall, handsome son named Saul whose name means, “asked of the Lord.” Kish has lost his donkeys, and he sends his son with a servant to look for them. They search a broad area for three days, but cannot find them, finally arriving at Zuph that many think is in the area of Samuel’s hometown in the hill country of Ephraim. Saul says to his servant, “Come, let us return, lest my father cease caring about the donkeys and become worried about us.” 1 Samuel 9:5. The servant tells Saul that there is a man of God (also called a seer, or prophet) in this city, and that whatever he speaks always comes to pass. Perhaps he can tell them where to find the donkeys. Saul points out that they have no present to give him, and that these holy men are supported by the gifts of the villagers they serve. Seers are consulted in areas such as issues of health, rituals and prayers, legal and political affairs, etc. The servant says he has a present to give of one-fourth of a shekel of silver, or about a week’s worth of wages. “Come, let us go,” Saul says, and as they go up the hill to the city, they meet some women going to draw water. “Is the seer here?” they ask, and the women answer that he is just up the road, headed to a sacrificial ritual on the high place. The ancient Hebrews and pagans consider any mountain or elevated place as being closer to where God dwells, and therefore, a good place to worship. The women add that he will bless the sacrifice and then those gathered will eat. As Saul and the servant come into the city, they meet Samuel on his way to the high place. The Lord has told him, “I will send you a man from the land of Benjamin, and you shall anoint him commander over My people Israel, that he may save My people from the hand of the Philistines; for I have looked upon My people, because their cry has come to Me.” When Samuel sees Saul, the Lord says to him, “There he is, the man of whom I spoke to you. This one shall reign over my people.” 1 Samuel 9: 16–17. Puzzled, Saul humbly reacts, “Am I not a Benjamite, of the smallest of the tribes of Israel, and my family the least of all the families of the tribe of Benjamin? Why do you speak like this to me?” 1 Samuel 9:21. On the high place, Samuel takes Saul and his servant into a hall where about 30 people were present, and has them sit in the place of honor. Then Samuel requests the cook to bring out the best portion of meat and bring it to Saul, the honored guest. Samuel and Saul eat the sacrificial meal—likely a peace offering—with the elders of Ramah. The “word of God” is really the fulfilling of the Lord’s plan to anoint Saul. Samuel takes a flask of perfumed olive oil and pours it on Saul’s head. This is sacred oil that is not to be used for any other purpose. Then Samuel kisses him as an act of respect, and tells him that he has been chosen as commander over God’s inheritance. This must come as a total surprise to Saul. 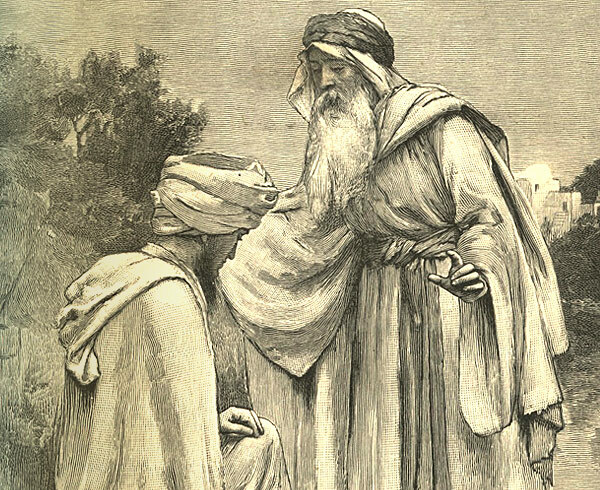 Throughout his interaction with the prophet, he hasn’t been told what God’s plans are for him. But now he realizes that he has been chosen for a special task. For some reason, God and Samuel do no reveal everything at once to Saul. Perhaps if they did, it might be too much for him to handle. The ancient Septuagint Greek translation of I Samuel 10:1 calls for a sign confirming the Lord’s choice of Saul. Signs are mentioned in I Samuel 10:7, 9, and a total of three signs are used to authenticate Samuel’s anointing. The first sign will be when Saul leaves Samuel and finds two men in the region of Rachel’s tomb. They will inform him that the lost donkeys have been found, and now his father is devoting his attention to his son’s welfare. The second sign will occur when Saul has come to the terebinth (oak) tree of Tabor, and meets three men going to worship at Bethel. One will be carrying three young goats; another will be carrying three loaves of bread, of which two will be given to him; and a third one will be carrying a skin of wine. The third sign focuses on a group of prophets coming down from the high place with musical instruments and prophesying. The Spirit of the Lord will come upon Saul and he will prophecy with them because the Lord will give him a new heart. The Hebrew word for prophecy is naba. The reference here is not to foretell future events, but to speak divine truths in the form of sacred song accompanied with musical instruments. The Hebrew indicates they are acting as spokesmen for God. This experience of the Spirit of the Lord coming on Saul with power authenticates him as Israel’s next ruler. All three of these signs literally occur that day and those that are acquainted with Saul say, “What is this that has come upon the son of Kish? Is Saul also among the prophets?” 1 Samuel 10:11. When Saul finishes prophesying, he goes up to the high place. His former life does not appear to have much to do with the Lord, but through recent events, he has allowed the Lord to drastically change him, even to the point of prophesying. “To look for the donkeys,” Saul answers, adding that when they saw that they were nowhere to be found, they went to Samuel. “Tell me, please, what Samuel said to you,” his uncle asks, and Saul responds that he told them plainly that the donkeys had been found. However, he does not tell him anything Samuel said about the kingdom of Israel, or his relationship to it. Samuel calls the people to Mizpah, about four miles northwest of Saul’s home at Gibeah. He reiterates what the Lord has done in liberating them from Egypt and the nations of Canaan that caused them adversity and tribulation. But they have told the Lord, “No, set a king over us!” So Samuel instructs all the tribes and clans to gather and cast lots to see whom the Lord has chosen. The lots, known as Urim (or “Curses”) represents a “no” response, and Thummim (or “Perfections”) represents a “yes” answer. The lots are stored in the breastplate attached to the ephod of the high priest. As the lots are cast, they fall on the tribe of Benjamin, the family of Matri, and finally Saul. But when they look for Saul they can’t find him, so they inquire of the Lord who answers, “There he is, hidden among the equipment, ” (which can also be translated as “supplies”). Samuel now announces the regulations or principles of the monarchical government that probably state the rights and duties of the king. He writes all of this in a scroll to make it permanent, and lays it before the Lord. Next, he dismisses the crowd and returns home accompanied by valiant men who agree with what the Lord has chosen. But some rebels disagree and say, “How can this man save us?” hinting that he is a nobody, since he is from the small tribe of Benjamin and has no military experience. As rebels, they violate the ancient custom of people seeking the help or favor of the prophet or king, by not bringing him gifts. However Saul seems to take no offense at this, and keeps silent about the whole matter. Nahash the Ammonite comes up and encamps against the city of Jabesh Gilead. Nahash in Hebrew means, “snake,” implying he is cunning, sly, and crafty. The Ammonites are perennial enemies of Israel, especially after their defeat at the hands of Jephthah, during the period of the judges. The inhabitants of the city attempt to make a peace covenant with Nahash by offering to pay tribute through taxes to the Ammonites. However, Nahash does not accept their offer, except on the condition that he put out all their right eyes. The gouging out of one’s eyes was a common practice in ancient time of those that broke covenant treaties, and in this case, the right eye makes soldiers unable to fight, since their shields were held over their left eye. However, his idea is probably more to inflict shame and reproach on the Israelites. The elders of Jabesh beg Nahash, “Hold off for seven days, that we may send messengers to all the territory of Israel. And then, if there is no one to save us, we will come out to you.” Nahash consents, thinking an army cannot be raised, since the tribes are reluctant to get involved. Soon the men of Jabesh will become permanent specimens of his power. The elders send messengers to Gibeah, where Saul lives, and announce the terms of Nahash’s demands. The people weep, and as Saul comes in from the field with his oxen, he asks why. Then the Spirit of God comes upon him and his anger is aroused. He takes his yoke of oxen, cuts them in pieces, and sends them with messengers throughout Israel, saying, “Whoever does not go out with Saul and Samuel to battle, so it shall be done to his oxen.” 1 Samuel 11:7. The fear of the Lord comes upon the people and they go with one accord to organize for battle at Bezek, 13 or 14 miles southwest of Jabesh Gilead. The Bible says that 300,000 come from Israel, and 30,000 from Judah, and Saul divides them into three military companies. The numbers are climactic in the biblical sense because all are multiples of three. The gathering of the armed men from all over Israel is miraculously accomplished in six days, and by marching from Bezek through the night, Saul reach Jabesh Gilead at the third watch, just before daybreak, on the seventh day. They totally surprise and overwhelm the Ammonites, killing them until “the heat of the day.” Those who survive scatter, so that no two soldiers are left together. The demonstration of Saul’s leadership causes Samuel to propose a national assembly at Gilgal, a religious center on Samuel’s circuit as judge. There they reaffirm Saul as king. This completes the third stage of his rise to monarchy. The first is when Samuel anointed him at Ramah, the second when he is chosen by lot at Mizpah, and the third is his reaffirmation at Gilgal with sacrifices of peace offerings before the Lord. Now Samuel gives his parting words as ruler over Israel, since Saul has now taken over. He begins by stating that he has heeded their request and set a king over them. He is now old, but can still be God’s spokesman to the people. He has walked before them since childhood and they are witnesses along with God that he never enriched himself by his office. Then, he reiterates their history and how the Lord has led them with leaders like Moses and Aaron who delivered them from Egypt. But when they forgot the Lord He had to deliver them into the hands of oppressors. But when they repented, He sent judges to deliver them. When Nahash came against them, they said to the Lord, “No, but a king shall reign over us,” when really the Lord was their ruler. Then Samuel says, “If you fear the Lord and serve Him and obey his voice, and do not rebel against the commandment of the Lord, then both you and the king who reigns over you will continue following the Lord your God. However, if you do no obey the voice of the Lord, but rebel against the commandment of the Lord, then the hand of the Lord will be against you, as it was against your fathers.” 1 Samuel 12:14–15. Next, Samuel tells them, “Now therefore, stand and see this great thing which the Lord will do before your eyes: Is today not the wheat harvest? I will call to the Lord, and He will send thunder and rain, that you may perceive and see that your wickedness is great, which you have done in the sight of the Lord, in asking a king for yourselves.” 1 Samuel 12:16–17. It is important to understand that rain never fell during the wheat harvest time, but as Samuel calls on the Lord, He sends violent thunder and rain, scaring the people to the point that they confess their sin in asking for a king. Samuel responds by exhorting them to not be afraid, but to serve the Lord with all their heart; for the Lord will not forsake them. Samuel also promises to pray for them and teach them the right way. Samuel has faithfully served the Lord and his people throughout his life. He handles things well when God tells him to step down as judge and allow Israel to choose a king. Then, after the transition is made, Samuel faithfully admonishes the people to obey and follow the Lord. On the other hand, Saul apparently has not grown up with the Lord heavily influencing his life, but when He gently brings him circumstances that affect him spiritually, he responds positively—to the point of being spiritually transformed! When told of his new role, and after being chosen as king, he remains humble. His beginning is very positive, but whether the rest of his life will continue to be positive it remains to be seen.